How do you plan for a project? How do you prioritize? Do you create your project in one go, or do you do it chunk-by-chunk? There are a lot of process for Software Development, and there is Agile Software Development. Agile Software Development is the “thing” for most software companies nowadays. It replaces the traditional way of software development process into a more robust, fast, and feature-driven development. So why am I talking about Agile? Well, Agile is what we do here in LegalMatch Philippines. Why and how we do it? Then, if I may, let’s proceed. In reality, we still can’t call ourselves Agile practitioners, we are still learning the ropes. I have asked our Project Managers on why we choose to go Agile and what benefits do we get from it. Indeed, before we transitioned to Agile, the work we are doing and how we do it almost fits an Agile Software Development model. Embedding the Agile Software Development model into our own development model makes it more beneficial in terms of time and quality. Well, a little tweak here and there completes the trick. Our previous development model was almost the same with how Agile works. Given this setup, most of our developers didn’t have a hard time in learning Agile. Well, they are still new to some Agile practices. To go a little deeper on how LegalMatch Philippines do Agile, I have asked (again) the help of our Project Managers on how did we transition to Agile, and what methodology we are using. The Agile methodology we are practicing is Scrum. As mentioned before, our previous model was a scum like setup. Using Scrum would mean a less learning curve and a smoother transition for our developers. Stand-ups help the team in knowing what the other members are doing and if there are any problems that affect the project. Having stand-ups help in prioritizing tasks in a daily basis. 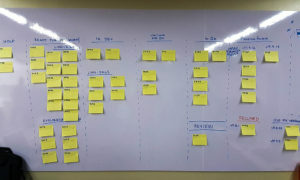 Sprint planning helps the team in prioritizing the user stories in the backlog. Most of the sprint planning we have are done through video calls because our Product Drivers (equivalent to POs) are in the US. Backlog refinement happens on demand if their problems encountered during the sprint or if there are still bandwidth and some developers can still fit in a user story or two without compromising delivery. Retrospective gives each individual a chance to reflect on what happened during the sprint. The team discuss on what things they have done that may be a good practice, what problems they have encountered and how to avoid them, and improvements for the next sprint. There are still a lot to learn about Agile, e.g., burndown chart, user story scoring, release planning, etc., but we are getting there as agile as we can.